Plant a Tree for Chanukah! Give the best Chanukah gift. Plant a tree in Israel to honor someone special. Planting trees is a beautiful way to show you care. It connects us to the land, celebrates our joys, and plants hope and optimism in the future of Israel. Each tree comes with a certificate of your choice, mailed to the recipient with your personal message. Printed certificates will arrive in 7 to 10 business days, and a downloadable e-card is available for immediate gifting during Chanukah this week! To get started, simply select a certificate of your choice below. 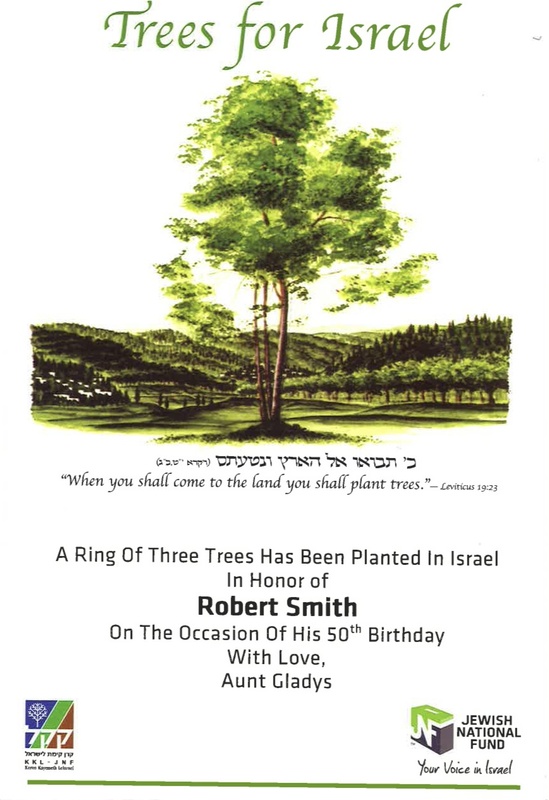 Trees For Israel certificate is a classic certificate and is appropriate for all occasions such as memorials or births. Over 100 years ago, Jewish National Fund began to replenish the native vegetation of the Holy Land that had disappeared or been destroyed. This beautiful, framed Garden Certificate is a view of Jerusalem illustrated by artist and friend of Israel, Leif Nelson. This certificate can be ordered when making a donation of $500-$4,999. The Children's Forest certificate features a patchwork quilt of children planting trees in Israel. Send this certificate to someone special for a birth or Bar/Bat Mitzvah celebration. For the cost of $1,800, a permanent inscription with the name of the departed will be etched on the JNF Wall of Eternal Life, located in American Independence Park over looking the hills of Jerusalem. As a tribute to Coretta Scott King and her message of peace and equality, a section of the Biriya Forest in northern Israel will be replanted as the Coretta Scott King Forest. The forest sustained extensive damage due to rocket fire during the summer of 2006. The Circle of Life certificate is a beautiful tree certificate that celebrates life and the Jewish tradition. Send this certificate in honor of a birth, bar/bat mitzvah, birthday, marriage or any other lifecycle event. The artwork for the Dance of Peace Certificate was donated to JNF by acclaimed artist Burton Morris, a recipient of the Tree of Life (TM) Award in 2015. The Celebrate With Trees For Israel certificate features a pair of hands planting a tree sapling. Send this certificate to mark any joyous occasion and connect the recipient with the land of Israel. The artwork for the Rejoice Certificate was donated to JNF by acclaimed artist Burton Morris, a recipient of the Tree of Life (TM) Award in 2015. Contributions from this certificate establish a forest in Israel in memory of the 1.5 million children who lost their lives in the Holocaust. Our hope is that the young people and children of today will honor the memory of these children by planting trees in our forest. The Unity of Israel certificate features people of all nationalities dancing in Jerusalem. Send this certificate in honor of a birthday, wedding or any lifecycle event. This charming certificate is perfect for honoring a birth, a birthday or a Bat Mitzvah. This charming certificate is perfect for honoring a birth, a birthday or a Bar/Bat Mitzvah. Send an attractive certificate to the child, and their name will be inscribed in the Bar/Bat Mitzvah book (Sefer Bar/Bat Mitzvah) in Jerusalem. JNF has added more than 12% to Israel's water supply, satisfying the needs of 1.2 million citizens, and now recycles 80% of Israel's waste water. But there is more to be done. Israel's population is growing rapidly and water-starved countries around the world are turning to Israel for solutions. Over the last two decades, Israel, a land that is 60% desert and only captures rain during the winter months, has managed to mitigate its water crisis with the help of JNF. JNF has built over 250 reservoirs and dams and conducts water conservation, research and recycling programs throughout Israel. JNF's all-occasion water certificates symbolize its ongoing commitment to expanding water resources in Israel and abroad, greening the land, and developing the Negev and the Galilee. In addition to receiving a beautiful certificate that evokes the spirit of Israel's pioneers, the name of your friend or loved one will be inscribed in the same hand-lettered Golden Books in which the founding father of Zionism, Theodor Herzl's, name appears. In commemoration of a marriage or anniversary, JNF's Golden Book of Marriage Certificate makes the perfect gift. Express your feelings and love for the land of Israel with a personal message. Includes an inscription in the Golden Book of Marriage (Sefer Nissuin) in Jerusalem. In commemoration of a marriage or anniversary, this certificate makes the perfect gift. In honor of his Bar Mitzvah, and as a way to link Diaspora teens with Israel and remember the lost children of the Holocaust, St. Louis, MO residents Max and his parents Judy and Bud Levin, decided to launch a new project with Jewish National Fund: The B'nai Mitzvah Remembrance Wall. Gifts of a Grove, Woodland, Parkland and Forest (donations of $5,000 and above) receive this special certificate mounted on a beautiful wooden plaque. In addition, your gift will be acknowledged with an inscription on a Wall of Recognition in American Independence Park in Jerusalem.